How to solve “Control does not exist in XML namespace” exception and Error:"Assembly X uses Y which has a higher version than referenced assembly Y" exception? 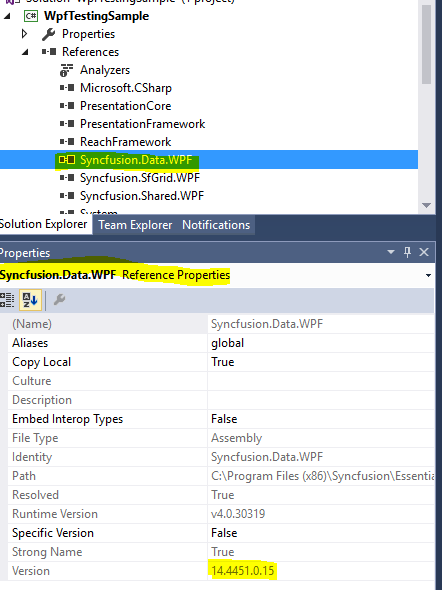 The exception like “SfDataGrid does not exist in XML namespace” will occurs when Syncfusion assemblies referred in the application differed from Application’s Target Framework or different versions of Syncfusion assemblies referred in the same project. Version 14.4451.0.15 – Denotes the assemble can be used in 4.5.1 target framework application. Version 14.4450.0.15 – Denotes the assemble can be used in 4.5 target framework application. Version 14.4400.0.15 – Denotes the assemble can be used in 4.0 target framework application. Version 14.4350.0.15 – Denotes the assemble can be used in 3.5 target framework application. As in the below code screen shot, Application target framework and all Syncfusion assemblies should target same framework version.